出演：カルムズ・ウイスキー・テールズ、サム・ベネット、SMILY & Friends、宮川舞子、Ahimsa Creative、DJ Jinki、バロー (VJ) and more! Tokyo. It’s time. It’s time to climb out of our shells and come back to life. It’s time to gather, create and participate. Come out to greet the spring. Come out to reclaim your creativity and reconnect. Come out for a little bit of this and a little bit of that. It’s OK, really! Featuring: Callum’s Whiskey Tales, Samm Bennett, Smily&Friends, Maiko Miyagawa, Ahimsa Creative, DJ Jinki, Barro (VJ) and more! Whether using drums, percussion, voice, electronics, jaw harps, mouth bow, strumstick, toys or random objects, Samm Bennett has spent the last few decades trying to put the right sound in the right place at the right time. He is a frequent performer on the Tokyo scene, where he is known as both a masterful improviser and a unique singer/songwriter. He has performed countless solo concerts over the years, and continues to do so, with a focus on his original songs. These are presented with stark, simple accompaniment, and draw equal inspiration from music traditions of the American south (such as Appalachian folk and Delta blues) as well as from African traditional styles. Next Generation Didgeridoo Performer Smily Smily was first introduced to the magical sounds of the didgeridoo while studying abroad in Australia. After returning to Japan, he continued to practice on his own, later adding beat-box and drum’n bass rhythms to produce an unimaginable range of sounds from a single instrument. He is currently active as both a solo artist and in a various collaborations with a wide range of artists. For this performance, Smily teams up with Wataru (keyboard) and J,M,K (Drums) for a transformative sound that will take you on a journey to another world. To ensure his sets retain their authentically homemade digital flavor, DJ Jinki mixes his zeros and ones by hand. 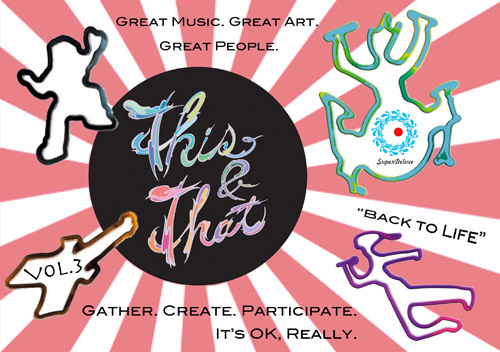 For This&That, DJ Jinki will craft a mix which includes Acoustic Crunk, Afro-Gypsy Disco, Baroque Dub, Chamber-Funk, Cabaret-Hop and other musical genres that he completely made up. Barro, aka D.H. Rosen is a Tokyo-based visual artist who loves to play with analog and digital media. His live sets are a combination of prepared digital imagery and spontaneous collage.